Imagine this: you’re hosting an event for your business or organization, and you’d like to turn your attendees into promoters for your event or cause. Consider taking advantage of a Facebook event frame to get the word out about the occasion! Facebook allows users to create frames for use on profile pictures, page photos, and stories. 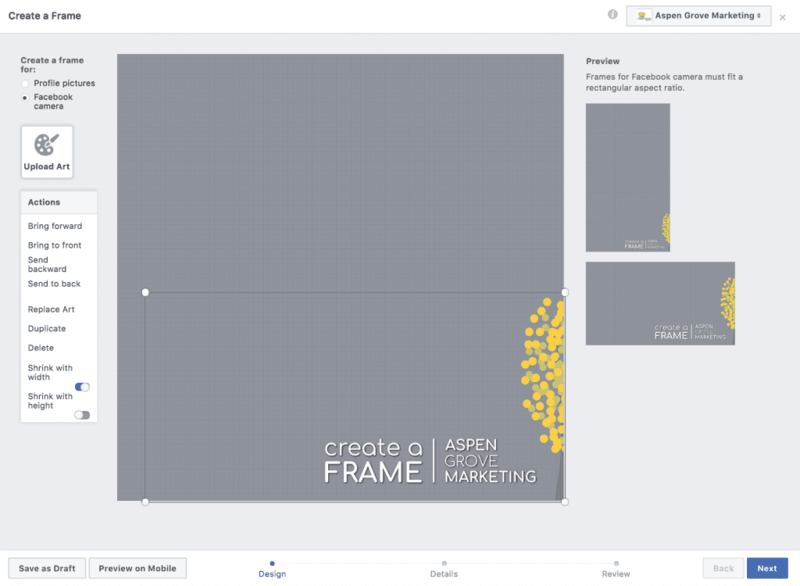 In this tutorial, your friends at Aspen Grove Marketing will show you how you can easily create frames for your followers to use to promote your event! You will need access to the Business Page from which you’re hosting the event. Although you can also create frames from your personal account, you’ll want to create event frames for your business’s events by connecting to your Business Page. You’ll also need a transparent PNG image to add to your frame. The Facebook Frame Studio is most easily accessible by desktop, so you’ll want to use your computer to set up your frame, rather than your mobile device. Head on over to the Facebook Frame Studio. Click the “Create a Frame” button. In the “Create a Frame” window that pops up, select your Business Page from the drop-down in the top right corner. Once you have selected your business’s account, decide if you would like to create a profile photo frame or a frame for the Facebook camera. We recommend selecting “Facebook camera,” because it allows Facebook users to swipe through frame options when talking about your event or adding to their stories. Position your art how you’d like it to appear on the frame, ensuring that it appears correctly on the portrait and landscape previews on the right of the screen. Once you have positioned your art how you’d like it to appear on the frame, click “Next” to edit your event details. Before entering the event specifics, create a name for your frame. Select your event location to “Anywhere,” or hone into a specific address or area to limit the availability of the frame to people in a certain location. Pro Tip: You can drop a pin anywhere on the map and adjust the radius if you’d like to broaden your frame location availability! 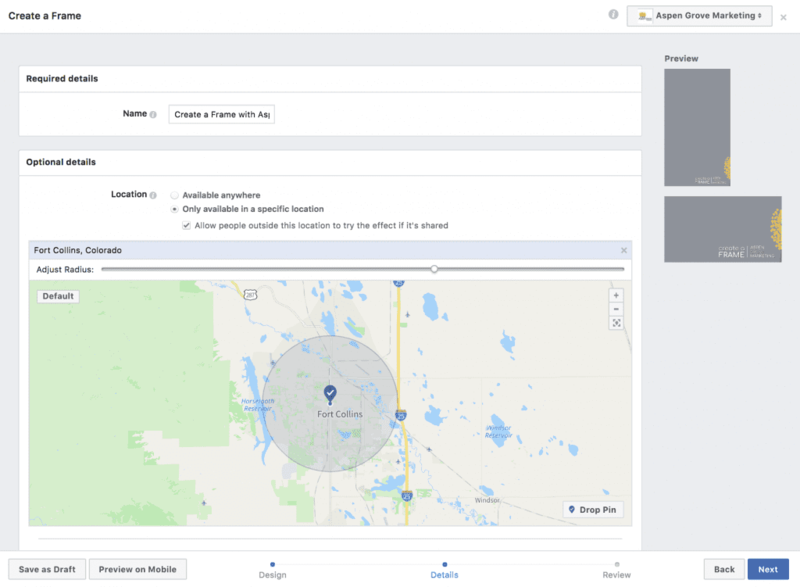 After selecting and tweaking your frame location availability, you can choose to make your frame available instantly (after Facebook review) or to be available during a certain date range. Choose your settings wisely, but remember that you can always turn off a frame via the Frame Manager at any time. If you wish, you can include keywords to help Facebook users find your frame more easily. Again, this can always be adjusted in the Frame Manager at a later date. Congratulations! 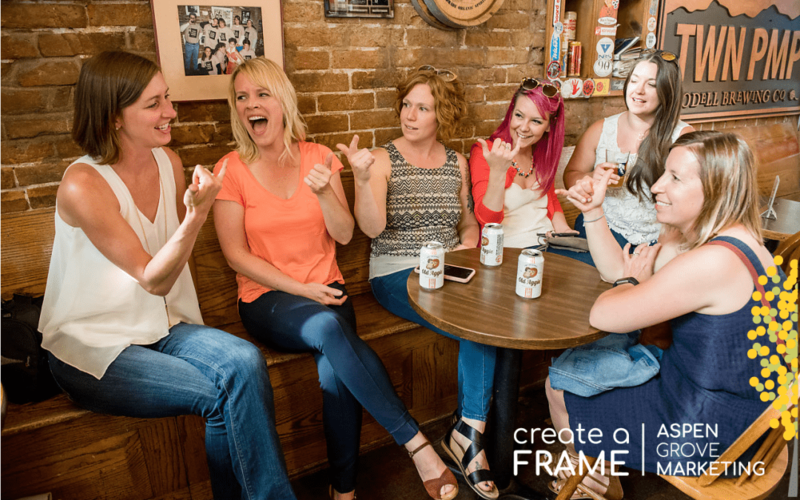 You’ve just published a Facebook event frame! Pro Tip: Share a link to your frame to your business’s or organization’s Facebook page to alert your followers that they can equip your frame! 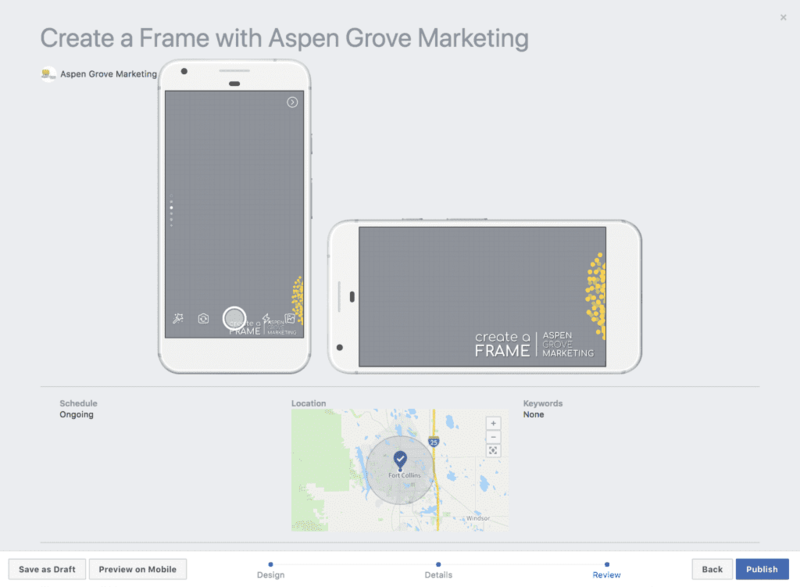 If you would like help improving, managing, and maximizing your social media accounts, including setting up Facebook event frames, please contact your Northern Colorado digital marketing specialists at Aspen Grove Marketing. We have helped businesses big and small with digital ad strategy and online advertising to meet their goals and succeed online. We’d love to do the same for your business.